PHILADELPHIA — Tomato pie, a Philly staple, is usually made here with bread dough, without mozzarella, at old-time bakeries in longstanding neighborhoods. The giant rectangular pie at Sarcone’s Bakery is an 18-by-22½-inch crust that is red with tomato sauce, nut-brown on the naked rim, sprinkled with Parmesan, and cut into 15 equally appealing squares. Almost everyone in Philly has a favorite piece. The choices are corner, middle, or side. “Middle or end,” says Vincent Iannelli, third-generation owner of Iannelli’s Famous Brick Oven Bakery. Here, the choice can be easier. The 18-by-24-inch “gravy pie” (old-timers use names like church pie, square pizza, red pizza, granny pizza, and red pie) is halved lengthwise, then cut crosswise three times for a total of eight colossal slices. With a pie divided like this, there are no crust-less middle pieces. But you still get the soft, gravy-soaked bites that are the reason to choose middle in the first place. Like pizza, tomato pie first appeared in the US around the turn of the 20th century, when the tide of Italian immigrants was strongest. Many credit Lombardi’s Pizza, which opened in New York in 1905, with being America’s first pizzeria. 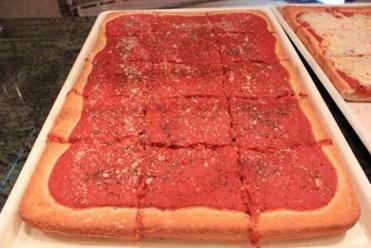 Tomato pie traces its origins in Philly to at least 1910, when Iannelli’s opened. “There used to be bakeries on every corner,” says Sarcone, whose great-grandparents opened Sarcone’s in 1918, “and these bakeries served tomato pie.” Though most of the bakeries are gone, you can still find tomato pie, made with hearty gravy, in the city of Philadelphia and the outskirts. The best tomato pies have thick bready crust, a generous layer of tomato sauce (or “gravy,” as it’s known in South Philly), and are cooked in a brick oven. They are served steaming hot and also at room temperature. The price is $2 to $3 a slice, or $20 for a whole pie. 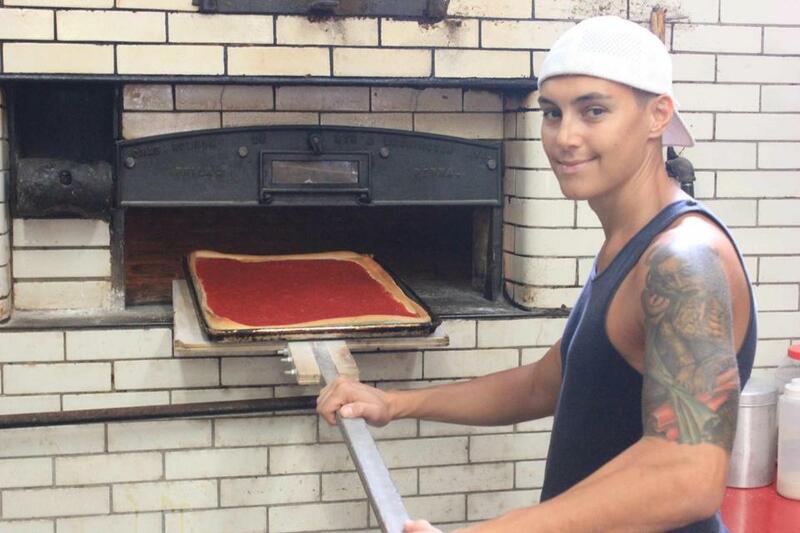 “My tomato pie picks up the flavor of the brick oven,” Sarcone says. “It tastes like you are dipping bread in gravy.” Sarcone starts with his bread dough, which has “malt, salt, and no sugar.” He ages the dough for six hours before cooking. It goes into one of a pair of connected oil-fueled ovens, behemoths that, together, are more than twice as long as a tennis court is wide. Soon, Sarcone takes out the plain dough without toppings using a 15-foot peel, flips it, adds gravy, and returns the pie to the oven. “This is the way my grandfather and great-grandmother used to do it,” he says. Louis Sarcone Jr. (right, with Louis Sarcone III) is fourth-generation owner of Sarcone’s, also in Philly. Even when the gravy is so good? That leaves one head-scratching question: corner, middle, or side? Chris Malloy can be reached at chrisamalloy@gmail.com.